Rider positioning, preparing for the trails & hunt, ground control and freestyle dressage are a sampling to be explored at this fundraising weekend equestrian gathering. Tryon, NC (September 29, 2017) – Thanks to Edge Brewing Barcelona, a rare opportunity awaits equestrians in the foothills of the Carolina’s as 501c3 nonprofit, Helping Equines Regain Dignity (HERD) www.herdrescue.org is pleased to announce two days of clinics on Friday, October 27th and Saturday, October 28th with KYB Dressage’s renowned trainers Yvonne Barteau and Kim Barteau, https://www.kybdressage.com/. 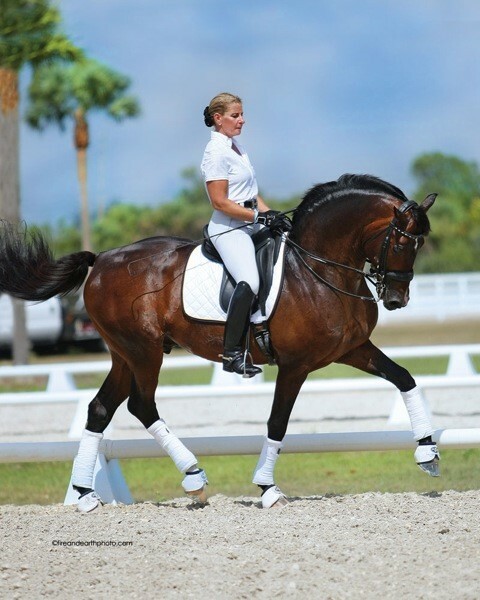 Collectively they have trained over a dozen horses to the Grand Prix level in dressage including the most winning horse in USDF history, GP Raymeister, along with the most winning Young Rider in USDF history, Kassie Barteau. In total, the dynamic team have brought over 60 horses to the FEI level of competition and qualified two horses for FEI Young Horse World Championships. The clinics will take place at Renovatio Farm, 1820 John Shehan Road, Tryon, NC, 28782, http://www.renovatiofarm.com. The Barteau are graciously donating their expertise so the proceeds raised will support local horse rescue HERD, which saves horses in danger of shipping to slaughter across US borders and rehabilitates them with care and training to be adopted into new careers. Clinic registration must be completed by October 20, 2017. To register for the clinic, please visit www.herdrescue.org and click on clinic tab. Edge Brewing Barcelona is providing the funds to bring KYB Dressage to Tryon for the film festival which allows them to be able to donate their time to conduct the clinics. Each of the clinics will feature up to three riding participants per session. Topics with multiple sessions include the following: Rider Position & Awareness, Tuning up for the Hunt & Trail, Equine Personality, English & Western Dressage Freestyle, Ground Control Basics and Rescue Horse Assessment. Each clinic is priced at $100 per rider including lunch, while observers/auditors can come watch all day for $20 person, or $30 per person a day with lunch, with no maximum capacity. Over the two-day event, young horses that are within HERD Rescue will be evaluated by Yvonne Barteau for their perfect career, to help facilitate training and a future adoption during her Rescue Horse Assessment classes. This is a rare opportunity for both horse and rider to learn from trainers who have coached horses and riders that have won over 100 USDF Regional titles and over 200 USDF Horse of the Year and All-Breeds Awards. Limited day and overnight stabling is available. Kim Barteau is particularly talented with training horses at liberty and teaching riders and horses to understand soft and nuanced aids and to develop solid foundations upon which FEI work is built while Yvonne Barteau is an accomplished dressage competitor, having earned her USDF Gold, Silver and Bronze medals as well as her Gold, Silver and Bronze freestyle bars. Her creativity flows into choreographing some of the best musical freestyles in this country, authoring books, including the award winning, Ride the Right Horse and the Dressage Horse Manifesto. She also authors original scripts for equine productions that the KYB Team has performed to packed audiences all over the country. Kim and Yvonne offer clinics around the world to help others become better trainers, riders and competitors and the KYB Dressage dynamic duo is also recognized for their film successes. Edge Brewing Barcelona was founded in 2013 by co-owners Scott Vanover and Tryon area resident Christian Oliver who wanted to bring American craft beer to the European market. In 2014, Edge Brewing Barcelona was voted top new brewer in the world, and that success enabled them to start a philanthropic arm of their company named Edge Brewing Equestrian. All profits from Edge Brewing Equestrian’s line of beers will be donated to an equine based charity, and this year local horse rescue group HERD, Helping Equines Regain Dignity, was selected as their beneficiary. Kim Oliver is delighted that Edge Brewing Barcelona is bringing increased awareness to HERD through their sponsorship of the Tryon International Film Festival taking place October 27th to the 29th https://filmfreeway.com/festival/TRIFF17. This sponsorship will enable KYB Dressage trainers, performers and horses to come to Tryon during this year’s festival, during which their movie, 'Into the Spotlight: The Journey of an Equine Theater Horse' 2017 will be shown at the Opening Night Gala on Friday, October 27, 2017. While visiting the Tryon area to support their movie, the KYB Dressage team has generously offered their expertise to teach clinics and perform and are donating their usual fees to help local horse rescue organization HERD. Edge Brewing Barcelona is proud to support organizations like TRIFF, HERD and KYB Dressage who share in their commitment to raise awareness about the plight of unwanted horses, highlighting rescue, retraining and repurposing efforts. To learn more about Edge Brewing Barcelona, please visit http://edgebrewing.com/.